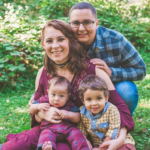 I am a Stay At Home Mama Bear of two Little Bears, a military wife, and Certified Breastfeeding Specialist who enjoys spending my free time with a camera in hand! I have a deep passion for supporting mothers and capturing beautiful, special moments, and hope to one day combine the two passions somehow. In the meantime, I'm just working to spread support, and find the perfect balance between coffee and wine.